A sponsor is someone who journeys with the candidate during his/her preparation for the sacrament. In making this choice, the church recognizes that your sponsor is a partner in your formation, and asks you to be conscious of their influence, trusting they will act in your best interests and in Jesus’ name. The sponsor will be asked to formally present you to the bishop at the Rite of Confirmation. 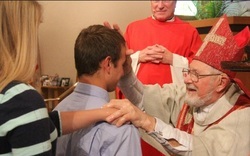 One of the Candidate's godparents may be elected as the sponsor for the Sacrament of Confirmation. The sponsor should be someone with whom the candidate feels comfortable talking about faith and religion. The sponsor should be someone the candidate looks to as a role model of the Catholic Faith. The sponsor is not required to attend program sessions, but will be asked to interact with the Confirmation candidate on a regular basis in regard to their Confirmation preparation. So they should be aware of the program and retreat schedule. Should be able to meet in person at least three times during the year to discuss the program and faith. The Sponsor will need to be present at the Ritual Practice and the Rite of Confirmation. How do I officially designate someone as a Confirmation Sponsor? In order to designate someone as your Confirmation Sponsor, you need to submit the following online form. Sponsors are also asked to submit a letter from their home parish verifying their Catholic affiliation. Build a positive relationship with you. Nurture and support your faith life. Invest quality time with the candidate. Here are some activities to begin the process of crossing paths together. Use these as starter ideas to learn to work together as Sponsor and Candidate. Go to Church together and grab coffee afterwards. Take a road trip together to some different churches to experience what is the same and what is different in different churches. Individually interview different people at St. Charles who are active members and compare notes. Why are they doing the ministry they've chosen? How did they learn about that ministry? In preparation for any particular Sunday, read and study the Gospel reading ahead of time. Each of you try to come up with three specific resources you might use (or assets you might be required) to take action on what you feel that Gospel is asking us to do. If you are having any difficulties selecting a Confirmation Sponsor please do not hesitate to contact Nick.